It's Sunday again.. boy don't the week's go quick when you are busy! and here is a card I have made using her... I have also used the Martha Stewart trellis border punch and the MS hydrangea flower punch, sequins and gems. I coloured my image with promarker pens. The stamped background was with an Elusive image stamp. I hope you enjoy using today's FREEBIE and I would love to see how you use her on your own cards. She is very beautiful. Thank you very much. 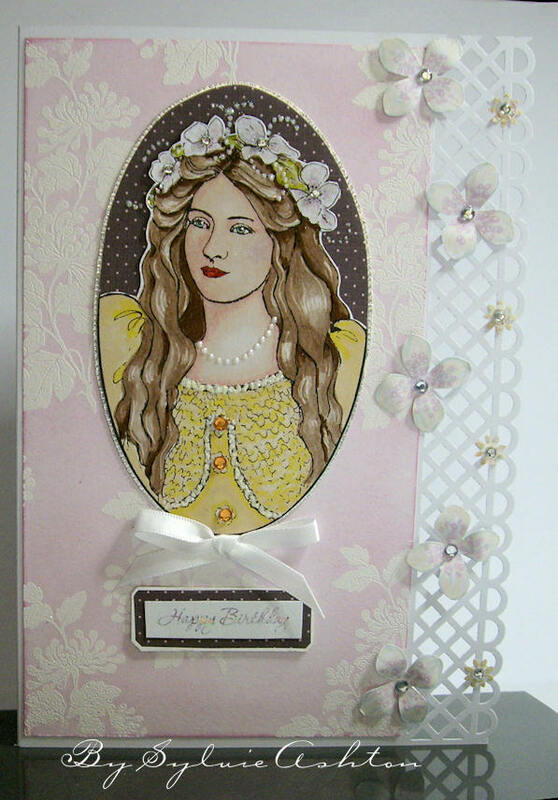 she is beautiful and so is your card---thank you very much for your wonderful freebies images. keep up the great art!!! She's a beautiful woman, I can't wait to use her. She is so elegant. Thank you so much. Thanks so much! Very elegant.